For most of us, insurance is a necessary facet of everyday life – as well as forming a large portion of the economic world we live in. The UK insurance market is the largest in Europe and the third largest in the world, and according to the Association of British Insurers (ABI) it employs around 314,000 people. In what is now Iraq, the Code of Hammurabi set out ancient Babylonian laws including on the topic of “bottomry” – a maritime insurance loan. A merchant would borrow money to fund his shipment, and could pay an extra sum to guarantee that the loan did not have to be repaid if the ship sank. Around the same time, Chinese merchants had started mixing their goods between vessels, so if one sank on its treacherous river journey it would not wipe out a single merchant’s stock. Rather than moving goods around, it was the Romans who first structured insurance as a financial contract a few thousand years later. The ancient Greeks and Romans both introduced the origins of health and life insurance with the creation of guilds or “benevolent societies” to care for the families of deceased members. Insurance contracts as a separate entity, i.e. not bundled in with loans or other contracts, were invented in Genoa in the 14th century. The oldest known insurance contract dates from here in 1347. In the early 16th Century, farmers in the Alps organised mutual aid societies, agreeing to look after each other if livestock or family members fell ill. This system views risk as something to be shared, as opposed to something to be traded on. In 1687, Edward Lloyd opened a coffee house on Tower Street, near the London docks. The shop became known as a hotspot for gossip, on topics including the plague, the Great Fire of London, and the ships sailing in and out, and what they carried. Gamblers placed bets on whether they would arrive safely or not. Edward Lloyd began to assemble a network of reporters and informers, and create a newsletter full of information about port comings and goings known as “Lloyd’s List”. If someone wished to insure a ship, insurers in the coffee shop would draw up a contract and sign his name underneath – hence the term “underwriter”. Destroying more than 13,000 houses, the Great Fire of London in 1666 had catapulted property insurance into the limelight as a matter of urgency. Sir Christopher Wren included a site for “the Insurance Office” when rebuilding London after the disaster. In the late 19th century, accident insurance was invented. Operating much like life insurance today, the Railway Passengers Assurance Company was formed in 1848 in England to insure against the rising number of fatalities on the railway system. 80 years after Edward Lloyd established his coffee house, a group of underwriters who hung out there formed the Society of Lloyd’s. 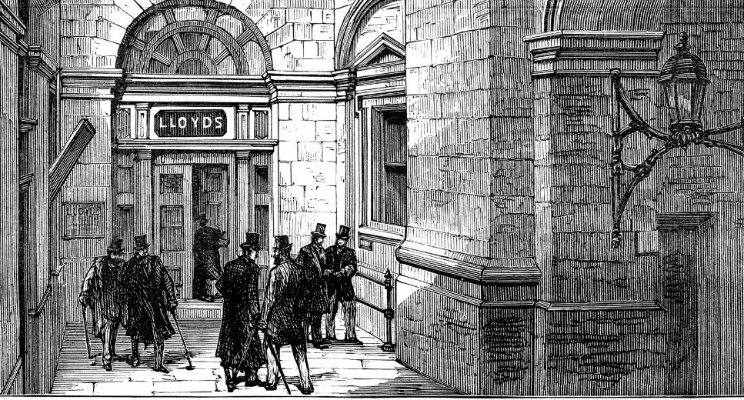 Today Lloyd’s of London is one of the most famous names in insurance.